Every month is dental month at Midvalley Animal Clinic!! Your pet's teeth and gums are vitally important to their overall health. Call our office to schedule a doctor consultation to see if your pet needs any dental work or cleaning. 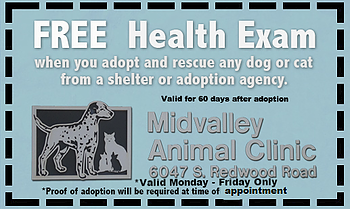 Pets over 6 years old or with pre-existing health issues will need pre-operative blood screening at an additional cost. Free doctor consultation for newly adopted shelter pets!